The tenth generation Ford Thunderbird was released in 1989 and within a few months the Super Coupe (SC) version was Motor Trend's Car of the Year. Luckily for people who like cheap cars, the COTY award is worth about as much as one of those 4x6 pre-paid post cards that fall out of automotive magazines like oversized confetti and the Super Coupe can be picked up for super cheap. 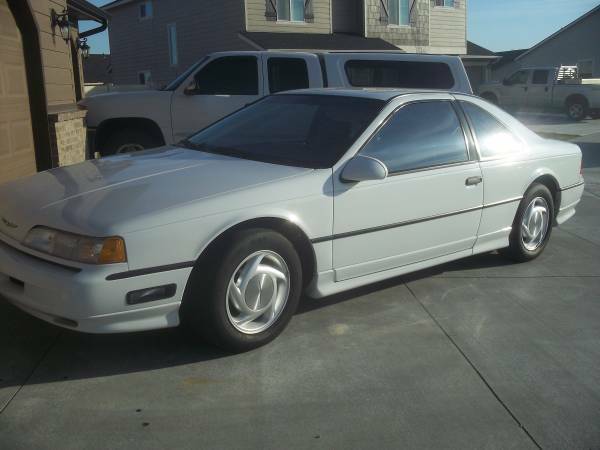 Find this 1990 Ford Thunderbird Super Coupe offered for $4,500 in Star, ID via craigslist. Tip from FuelTruck. New to the 10th gen T-Bird MN12 chassis was an independent rear suspension, a supercharged V6 and a Mazda sourced 5-speed manual gearbox. But if you wanted all of those goodies together, the only way was to get the Super Coupe with a starting MSRP of $20,390 -- a considerable upcharge from the basic $14,980 of the standard version. 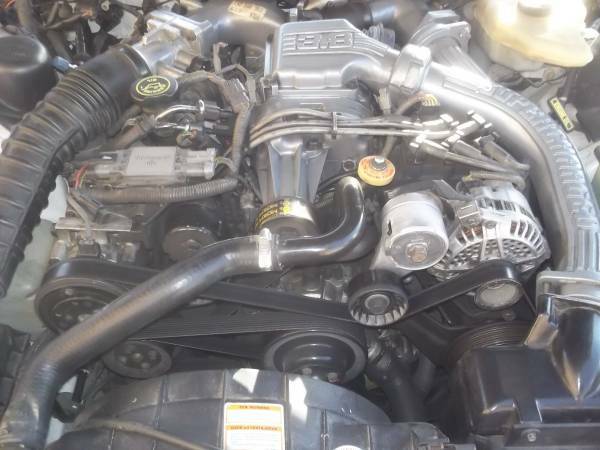 Under the hood is a 3.8 liter V6 that is boosted with 10 psi from an Eaton M90 Roots-type blower from the factory to produce 210 horsepower and 315 ft-lbs of torque (which was more powerful than the optional 200 horsepower 5.0 V8 available starting in 1991). 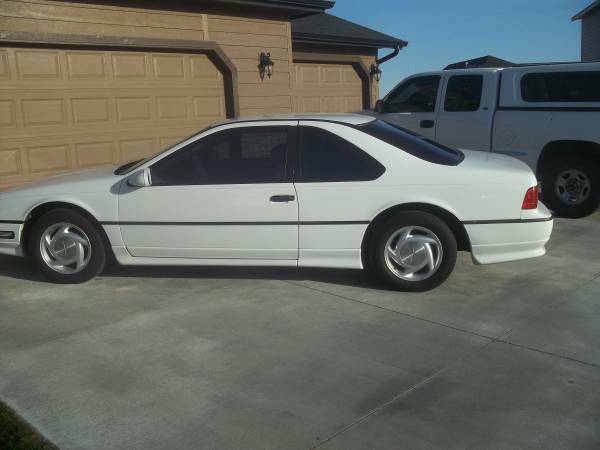 This white knight has the optional 5-speed gearbox and the interior is in okay shape -- but the real star is the Oxford White paint job on the outside -- and there is a reason it doesn't look like a peeling sunburn. All of the other Ford colors were base-coat, clear-coat -- the clear fell off a few years after leaving the factory -- but the white was a single stage and will last for decades with basic care. This thing is really nice. Basically a super-charged, IRS Fox-body. Please, someone tell me that there is an easy way to convert from mousey belts to regular belts on one of these. Surely the regular attachment points would still exist on the Fox platform. I still like it, however. I think the Canadian car had regular seat belts, so maybe they could be retrofitted. 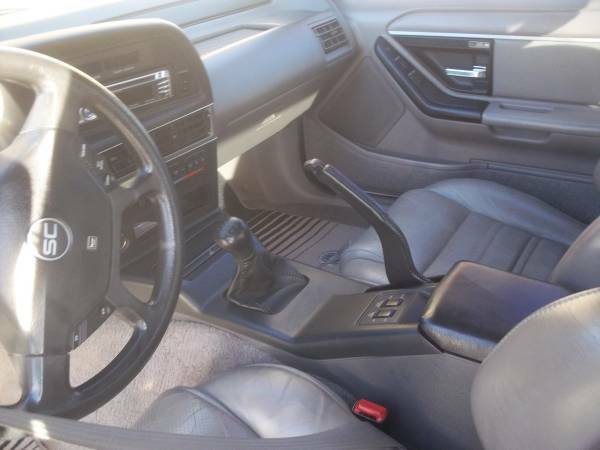 Later models got airbags and conventional belts, but the interior trim had been changed significantly by that point so I'm not sure how much is directly usable. These are a pretty nice car to drive - heavy, and not fast by present standards, but for their time they were pretty entertaining. Trivia: the early 5-speeds (like presumably, this one) got asymmetric rear axles, one side was a conventional solid bar, the other was a fabricated assembly with a large-diameter tube in the center, commonly referred to as the 'fat shaft'. This went largely unnoticed at the time, but it was done to create two slightly-spaced load peaks (reducing rear suspension shock loads and wheel hop) on hard launches. GM had to relearn this lesson a decade and a half later on the CTS-V. There were all kinds of aftermarket fixes offered for the Cadillac, pretty much all of which (solid subframe mounts, diff-mount braces, etc.) went barking off in the wrong direction. The suspension design was pretty good for its time, an era when all the Germans were still running around on Macstruts and semi-trailing arms. The Ford version got big cast-iron lower arms, the airbagged Lincoln Mark VIII got aluminum. The next US-market Ford IRS was the Mustang Cobra, which did not have asymmetric axles and doesn't seem to have any particular wheel-hop problems. Then there's two generations of IRS used in the Australian Falcons, and then the Lincoln LS, and now the current Mustang, and all these designs are quite different from one another. Oh one other factor on these: if you think about buying, do your parts-availability research, because like most low-number Fords most significant bits have been NLA from Ford since the end of the Clinton Administration. To each their own. I always thought the Jack Telnack-era designs were one of the few times since 1970 that US Ford had gotten anything right. I even drove the sister car AKA Cougar with a 5.0 had a few miles on it but what a POS always felt like it was about to self destruct.....i told the owner i would drive the company car from now on it was that bad close to a Dasher Diesel wagon i refused to drive it also. I've driven several. None but the SCs actually moved when you pushed the right pedal; they weighed 4000lb and the base motor was a 140HP 3.8, the V8s made 200ish HP and generally less than the other platforms that got those engines (pushrod 302 and lame SOHC 4.6) because the hoodline constrained the shape of the intake. I recall being in the higher (heh, heh) parts of Colorado and New Mexico on business back when these things were new, and had a couple as rentals, and the 3.8 could barely get them out of the parking lot at that altitude. My boss had a Couger XR7 with the supercharger and loved that car. When he was pushed out what cinched the deal was letting him take it with him.